This is no walk in the park. For the first fifteen minutes or so you have no idea why we are following the daily activities of some desperately poor people living in the Ozarks Mountains somewhere in Missouri. The pervasive pale silvery-grey colours set the tone with just a hint of what is to come in this gripping rural crime story. 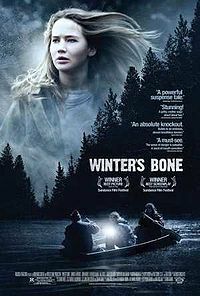 The acting is uniformly first rate although that of Jennifer Lawrence is the best. for some drug material, language and violent content. Mention of the fact “he's cookin' again” is not the sort one does at home nor that which takes place in a restaurant: it is the illegal manufacture of the psychoactive stimulant methamphetamine, better known as crystal meth.